One of my sisters friends asked me to make her wedding cake. I was so flattered that she would think I could do it, that I said yes. I've only made birthday cakes, so I thought I should do some practice before the real thing. Here is two looks I've come up with. They aren't perfect and may look weird. I got tired of baking cake and wanted to try a few different things. I like this one. It was super easy. All I had to do was cover with fondant and wrap with a lace ribbon. For the second look, I thought I would try to replicate this cake from Real Simple Weddings. As you can see I need a smaller tip and a lot of practice. The bride liked it though and I will try and do it for real in a few weeks. Wish me luck. WOW, awesome job!! I wish I was able to do wedding cakes. They really are pieces of art! Awesome job! I love it!!! I am generally a lurker, but had to come out to give you props. Not only is that cake beautiful, good for you for stepping out of your zone to help this bride out, too! Oh my gosh, it's gorgeous! It looks original and I love it! This cake will probably generate lots of requests for your wedding cakes! If those are your practice cakes than I expect to be seriously blown away by the real thing! I made wedding cakes for my two younger sisters. I was really happy with how they turned out but I do remember how stressed I was. It is a lot of pressure to make someones wedding cake. Just blogging around this morning. I love that beautiful cake. I was never very talented at any type of cake decorating. I even had trouble speading just regular icing, don't really know quite why. But anyway, a beautiful job, and thank you for letting me visit. OH!!! those are BEAUTIFUL!! 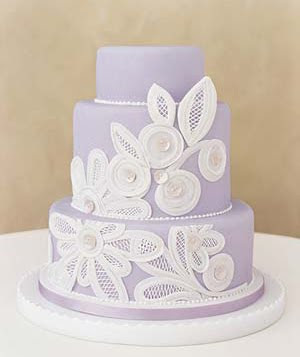 i have been pondering taking a cake decorating class...it seems so fun! As usual, I'm simply amazed. You have such talent!